The main Computer Room is situated on the Third Floor and a smaller computer area is located on the Mezzanine (above the main entrance). 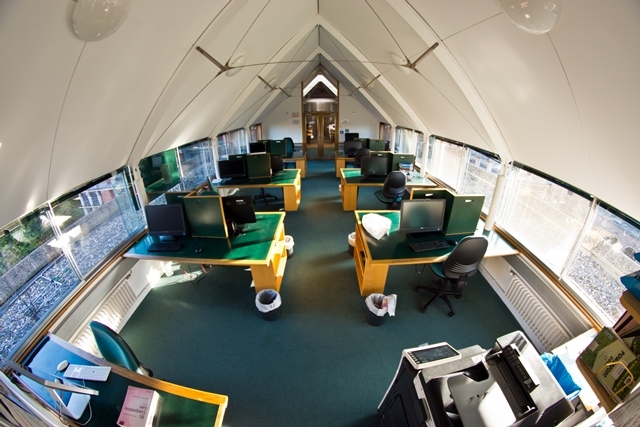 Additional workstations are available on each floor of the Library. A computer room is also available in the Fisher Building. All workstations are part of the Managed Cluster Service (a service provided by the University Computing Service in conjunction with the Computer Manager's Office) and are connected to University network servers known as the 'DS' - Desktop Services. To use any of the PCs/iMacs you must log on to the network with your DS user id and password. Almost every new member of College will have been registered before arriving in College and will receive a letter from the University Computing Service with his or her details. You are advised to change your password the first time you log on to the network. If you have not received a registration letter, you will have to register with the University Computing Service. N.B. These machines are not generally available for use by readers who are not members of St John's College. There is a multi-functional device on the Ground Floor and another on the Third Floor. Both devices provide colour and black-and-white printing, photocopying and scanning. You will need your University Card to log on to the devices. To use the printing and photocopying facilities, you first need to purchase eCredit. This can be done online using a credit or debit card (instructions on how to do this are available from the Library Issue Desk), or in person at the University Computing Service Reception. Additional (desktop) scanners are located in the Mezzanine Floor computer area and in the Third Floor Computer Room. Both must be used in conjunction with the computer to which they are connected. Please observe the Copyright, Designs and Patents Act 1988 when photocopying copyright material. It is a criminal offence to infringe this Act. Guidelines on copying copyright materials are displayed by each copier. Please read them. A wireless network is available throughout the Library. Laptops may be connected to the internet via points at most desks. All laptops must be registered for use in the College with College network management system. For information on connecting to the Eduroam Wi-Fi, please visit this page. Smartphones can connect to this network too. During Full Term, students are welcome to visit the IT Helpdesk, located on the Ground Floor of the Library, to receive advice in person. At other times students are advised to contact IT Support by email or telephone. The Helpdesk opening hours and contact details are listed on the IT Support page. For further details on the College's computing facilities you are advised to read the IT Department information on this website.